Montavilla Farmers Market: We’re All in this Together! Portland Oregon’s Montavilla neighborhood has just been dubbed by Lonely Planet as one of ten U.S. neighborhoods you need to visit. A standout neighborhood suggestion is a Sunday visit to the Montavilla Farmers Market. Founded in 2007, the market is a popular weekend fixture on Stark Street. Sitting in the shades of Mt. Tabor, a dormant volcano, the farmers market is well-trodden and beloved. Follow along with the Stark Street market snaps through November 19th on Instagram! Amanda Cross: The Market was founded by a grassroots collection of neighbors who were inspired by visions of a fresh, local food market in a shared community space within the growing Montavilla neighborhood business district of Portland, OR. This dedicated group opened the Market in just 10 short months with a small amount of grant funds and a generous outpouring of donations from local businesses, friends, and neighbors. The tireless energy of these un-paid visionaries and countless other volunteers allowed MFM to open its first Market on Sunday July 22, 2007 with 17 vendors and over 2,000 visitors! The Market has expanded each year of its operation. For the 2017 season MFM will have 3 paid part-time staff and as many as 60 vendors on its roster. We are a food and farm focused market with our vendors coming from within 150 of our location. Our processed and hot food vendors are required to buy a percentage of their ingredients farm-direct. The goal is a full market basket of items – produce, fruit, meat, eggs, cheese, lunch fare, bakery, wine, and wise selection of processed foods. AC: We’re a single market, located outdoors throughout our season. This year we’ll be open 30 weeks, operating every Sunday from May 7 through October 29, 2017, in addition to a Thanksgiving Market on November 19, and Winter-Stock Up markets on December 17, 2017, January 14, 2018, and February 11, 2018. The Montavilla neighborhood began as a rural farming community over 100 years ago, just east of what were then the city limits of Portland. In recent years, Montavilla has had a resurgence of locally-owned businesses that have sprouted up in the business district, along the street where the market is located. Montavilla residents now enjoy a movie theater, pet supplies store, bike shop, yoga studio, diverse restaurants and bars, coffeeshops, custom clothiers and housewares, and other small shops which are creating vibrancy on our main street. This revival of the historic Montavilla neighborhood was the impetus for the Montavilla Farmers Market. AC: This year we look forward to highlights such as an exciting volunteer program, music at the market, a monthly Taste of the Market, youth cooking workshops, partnership with the Montavilla Street Fair, and our Double Up Food Bucks bonus match for SNAP customers. AC: We use a weekly e-newsletter and regular updates to our website to broadcast our vendor roster each week and highlights of what the vendors will be bringing. Instagram and Facebook are great for sharing pictures of the market, and getting our events on people’s calendar. We often share our posts to the many other neighborhood and interest Facebook pages. We’re also trying out using NextDoor, and tabling at neighborhood events and schools. Good signage at the market site is an important investment. Our dot surveys say that after word of mouth, most people learn about us by happening by on market day or seeing the sign on our market barn. The sign was not a huge expense, and takes very little staff time to make seasonal changes and updates (as compared to updating the website and social media). More signage, or a mural on the neighboring business wall, would probably be worthwhile next steps for us. We are still growing our marketing and outreach committee and sometimes recruiting volunteers who can make a longer term commitment that will allow them to see a project through can be tough. To work around this, we are trying some new strategies with our committee by having “work parties,” where volunteers can come for just one evening to help with making buttons, branding pictures, posting web updates, and making the work fun and social together. 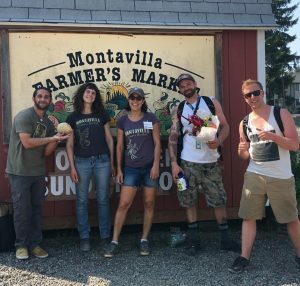 AC: In Montavilla we see the social, economic, and environmental value in providing a venue to support local agriculture. 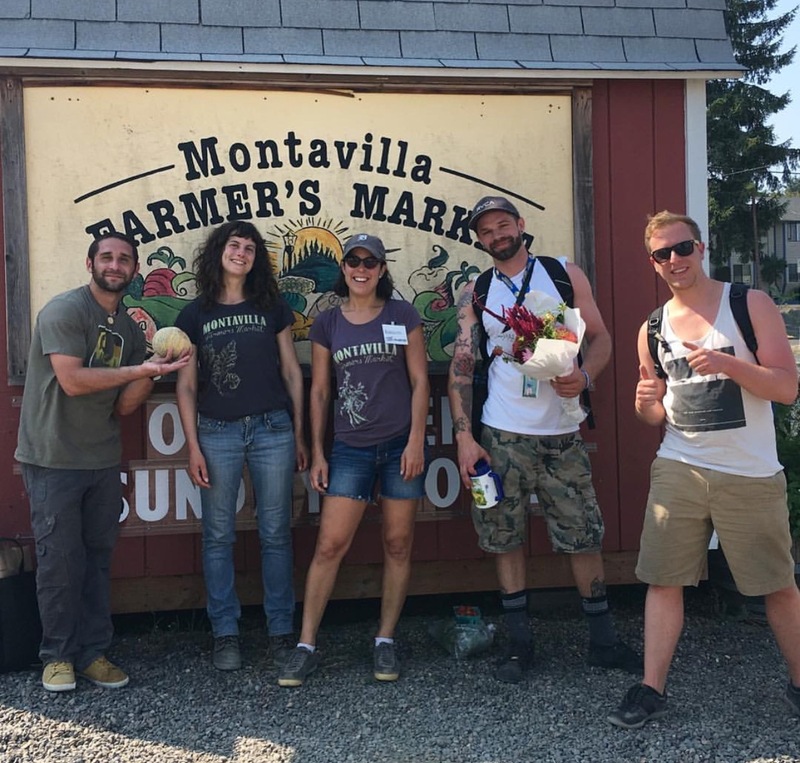 The Montavilla Farmers Market is a community asset and means to a healthy lifestyle, increased neighborhood livability, and productive regional economy.